Human dignity is inviolable. It is inseparable from the human being. How incomparably precious human dignity is often becomes clear only when one loses it. If one declares with sublime intention, that human dignity is inviolable, it is of course shocking when not only human dignity, but also the physical body is being harmed. We are already accustomed to hearing about human rights violations. But what underlies this buzzword is much more than just a legal term. It describes the dehumanization of persecuted people. Given the violation of the fundamental rights of the human being, isn’t it the case that not only the dignity of the persecuted being is violated, but also that of the bystander? How can we still value our own human dignity if we stand by and allow this human dignity—an inherent characteristic of mankind—to be violated in others? Today, we see the consequences of the dehumanization and condemnation of dissidents and the resulting loss of the inviolable dignity of the human being in the example of Falun Gong practitioners in China. The degree to which human dignity is seriously violated in China can be witnessed in the fact that how much courage is needed to write about a taboo subject such as the persecution of Falun Gong. The imposed censorship in China—and the self-imposed censorship outside China—stifles any coverage of this issue usually in the beginning. But we owe it to our human dignity not to follow the pressure of this self-censorship. Human dignity is universal and can neither be limited by national borders nor by censorship. Today, the meditation practice of Falun Gong is a dramatic case study in the state of human dignity in China. In the past 22 years, Falun Gong has experienced a rollercoaster of extremes, from the greatest popularity throughout China to brutal, nationwide persecution. Like no other example of today, it is thus suitable to describe what dehumanization of dissidents can result in. The story of Falun Gong can be briefly summarized thus: After its introduction in 1992, it had won numerous awards and had quickly gained widespread popularity. China’s Ministry of Sport advertised on TV about Falun Gong and praised its positive effects on health. By 1999, about 70 million to 100 million Chinese had started to practice Falun Gong. Among the Chinese populace Falun Gong practitioners were known to be friendly and helpful. Since Falun Gong is a self-cultivation practice in which everyone is mindful to improve oneself and cultivate one’s inner self, by nature Falun Gong practitioners don’t get involved in political discussions. In July 1999, the situation of the acclaimed self-cultivation practice changed overnight and Falun Gong was banned and persecuted for no reason and in violation of the Chinese Constitution. For 15 years now, Falun Gong practitioners have been persecuted in China and in one way or another way—outside China—by Chinese embassies and student associations in foreign universities. Thus, on one side the persecution of Falun Gong is composed of brainwashing, labor camps, prison, torture, and forced organ harvesting, and on the other side of propaganda and media, lies that have been adopted by Western media—partly out of ignorance and partly out of self-censorship, in order to not jeopardize future journalist visas for China. The topic of Falun Gong is declared taboo and Western media reports only sparsely about Falun Gong or not at all. The persecution of Falun Gong is not only embedded in a core part of Chinese domestic and foreign policy, but also devours huge amounts of China’s state budget. The subject of human rights violation is also evident in the legal field. In China lawyers themselves face imprisonment if they do not follow the unwritten rules of the staged court hearings—where the verdict is already decided before the court opens the case—and defend those who have been ostracized by the one-party system before the trial even begins. The rule of law is out of the question. What matters is party policy. Those who do not comply will be framed as “enemy of the state.” The dehumanization takes place in the courthouse. In the case of Falun Gong it means that labor camps, brainwashing, and torture have become the norm since 1999. Soon thereafter the persecution of Falun Gong claimed its first deaths by torture, which by order of Jiang Zemin were propaganda-friendly declared to be “suicides.” The demands of the one-party system subdue reality. Reality in today’s China is out of touch with the real reality. Reality in China is what the party defines as such, and that runs from the bookkeeper in a small business, via mass media, to the courthouses. But in this case the reality outside of China is different from the reality inside China, and this also applies to the concept of human dignity. In today’s China, human dignity is an empty concept and for many Chinese it is often unclear what the West understands as ethics, morality, and human dignity. But if the respect for human dignity is not part of the reality in China, then we have to ask: Where will this end? A look into the medical field unveils it: traditionally Chinese people are reluctant to donate organs for transplantation. This is deeply rooted in the populace. Therefore, there is a great shortage of donor organs for transplantation in China. In order to provide organs for transplantations, a law in 1984 allowed that organs can be procured from executed prisoners. Having this law in mind, it was only a small step not only to take organs from executed prisoners, but also from prisoners of conscience, such as from Uyghurs, Tibetans, and Falun Gong practitioners. After the persecution of Falun Gong began in 1999, the practice of harvesting organs from executed prisoners was extended to Falun Gong practitioners. Millions of persecuted Falun Gong practitioners were exposed to the risk of being categorized and placed in the secret organ pool. Organs were then removed on demand and on short notice, without the consent of the detainees. While being incarcerated in labor camps and re-education camps they were systematically physically examined. Costly blood and urine tests, ultra-sonograms and x-rays were routinely carried out on detained practitioners. If one has invested millions of dollars in unrequested medical diagnostics among forced labor camp workers and prisoners of conscience during 15 years, then the question emerges where such costs will amortize. 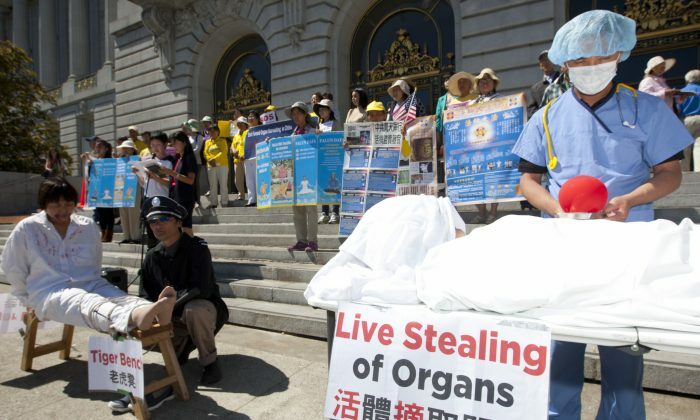 Instead of being tortured to death and their bodies being wasted, Falun Gong practitioners became a profitable source of transplant organs. After 1999 Chinese hospitals began to advertise organ transplantations on the Internet. This happened during a time when China did not have a public organ donation program. The trade flourished. The goods: organs; the delivery time: 1–4 weeks; the price tag: a kidney for $60,000, a liver for $100,000. In the fall of 2013 reporters of the German magazine “Der Spiegel” pretended to want to buy a kidney via a Chinese Internet organ broker. The price tag was about $350,000 for a kidney from China. From 1999 to 2006 the number of transplant centers in China rose from 150 to 600 and one may wonder on what foundation China had the confidence in a continuous, long-term supply of organs without having a public organ donation program. At the same time that execution figures declined, the transplantation figures in China increased dramatically after 1999: from less than 3,000 transplants before 1999 to up to reportedly 20,000 in 2005. One might wonder: where did the transplanted organs come from? Behind these abstract figures hides a cruel reality: in China, prisoners of conscience are killed on demand for transplant organs—without having received a death sentence, without having committed a crime, without having given free, voluntary consent for the organ donation. The sad truth is that the participating doctors in China have led transplant medicine into the absurd: one cannot cure patients with transplantation by killing other people for their organs. A closer look at Falun Gong tells us how much the persecution of Falun Gong also relates directly to ourselves. If we ask ourselves what all this has to do with us, we will find: very much. Falun Gong is a self-cultivation practice that teaches fundamental principles. In the case of Falun Gong these principles are truthfulness, compassion, and tolerance. One will probably agree that these three principles are regarded as laudable and desirable around the world. They are more or less universal. However, inexplicably, Falun Gong is now persecuted in China precisely because of these good values. The persecution of Falun Gong is not only directed against Falun Gong, the persecution of Falun Gong is also directed against the goodness in mankind. Truth is certainly public enemy No. 1 in China, especially when a country is largely governed by corruption, when intellectual theft and piracy are common, and the freedom of media has degenerated into self-denying self-censorship. Compassion is certainly also public enemy number 1 in China, if the idea of class struggle is still present in the society and if behind harmonious, diplomatic words, the population is tuned into an iron-fist foreign and domestic policy. Tolerance is certainly also public enemy number 1 in China, if the voices of dissidents are not tolerated and any deviation from the Communist Party’s directives is answered with brutal violence and intransigence. In other words, the unfounded and irrational persecution of Falun Gong and its three principles is also a crusade against the goodness in mankind, against the foundation of human dignity, and against values that are simply the cornerstone of humanity. If the free exercise of truthfulness, compassion, and tolerance is answered with torture and in extreme cases with forced organ harvesting from living prisoners, aren’t the people who don’t exercise Falun Gong, but who are fond of honesty, kindness, and tolerance also at risk? If China’s one-party system is constantly in the struggle against the three No. 1 enemies of the state, when will our own human dignity outside China be violated just the same as it is presently in the case of Falun Gong practitioners? The answer is shocking: it is already happening now. From a humanitarian perspective one cannot limit human dignity by national borders. Human dignity is universal. The forced organ harvesting from living prisoners in China has crossed the lines of humanity. The regime in Beijing gives the prisoners of conscience the choice to die either physically or spiritually. This choice is inhumane. Everyone should reflect for a moment and wonder how one would respond to this choice if one faced it oneself. Passively watching as others are brought to this inhumane choice is nothing other than abandoning one’s own human dignity. We create our reality every day anew. If we cherish our human dignity and basic rights, then we have to care about them every day, otherwise we might lose them quietly like an unwatered plant loses its life. Falun Gong practitioners have taken care every day for 15 years. In the past 15 years Falun Gong practitioners have done more for the dignity of the human being, mankind, and humanity than the one-party regime in Beijing. Perhaps it is now up to us to get active and engage the goodness in mankind. We owe it to ourselves. With the forced organ harvesting from living prisoners of conscience a line has been crossed. It is now time that we defend the inviolable dignity of the human being. Dr. Torsten Trey is founder and executive director of the international NGO Doctors Against Forced Organ Harvesting (DAFOH). DAFOH is committed to ending forced organ harvesting and promotes ethical standards in medicine. Australian parliamentarians from major political parties have officially joined forces for the first time to address the pressing issue of forced organ harvesting.